Children and young people’s voices in Swaziland’s media are heard in only 8 percent of the stories that are about them, according to new research by Swaziland’s Media Institute of Southern Africa in partnership with child rights NGO Save the Children. The country’s two daily newspapers, Times of Swaziland and Swazi Observer, both published Monday to Friday, were monitored by Swaziland’s Media Institute of Southern Africa (MISA-Swaziland) from May 22 to June 2, 2013. The Times of Swaziland, during this period, published 42 stories about (or involving) children or young people. Of those 42 stories about children/young people, only 3 stories (7%) included the voice a child/young person. Therefore, in the Times of Swaziland from May 22–June 2, children/young people were heard in only 7% of the stories that are about them. The Swazi Observer, from May 22–June 2, published 30 stories about (or involving) children/young people. Of those 30 stories about children/young, only 3 stories (10%) included the voice of a child/young person. 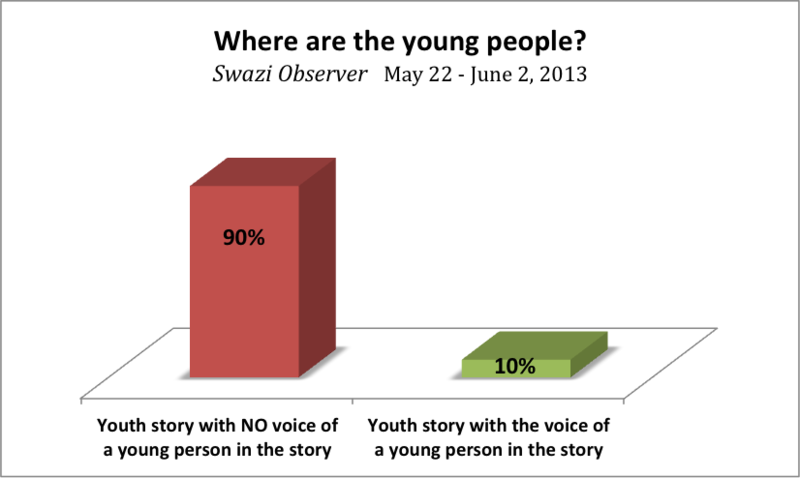 Therefore, in the Swazi Observer, children/young people were heard in only 10% of the stories that are actually about them. In total, when you combine the figures for both Times of Swaziland and Swazi Observer, from May 22–June 2, there were 72 stories about children/young people. Of those 72 stories about children/young people, only 6 stories included the voice of a child/young person. 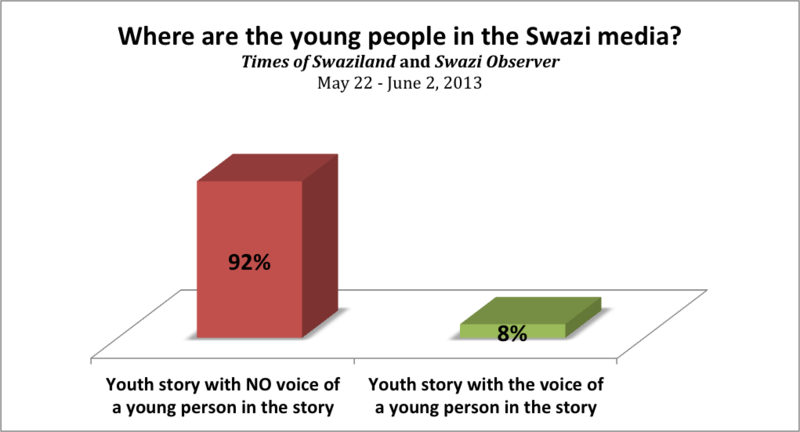 Therefore, for both Times of Swaziland and Swazi Observer, from May 22 to June 2, children/young people were heard in only 8% of the stories that are actually about them. Which means, in 92% of the stories about children/young people, the voice of a child/young person is absent. This MISA-Swaziland and Save the Children study does not claim to be conclusive or totally representative of the Swazi media. The Swazi television and radio station, both owned and controlled by the state, were not considered in this study. There are also other newspapers and a monthly magazine that were not considered in this study. The Times of Swaziland Group of Newspapers (in addition to the daily newspaper that was monitored for this study) also publishes a Saturday weekly Swazi News and a Sunday weekly Times of Swaziland Sunday. And the Swazi Observer Group of Newspapers (in addition to its daily newspaper that was monitored for this study) publishes a weekend edition, Weekend Observer. It should be noted that if these weekend newspapers were included in the study, the number of child and young people’s voices may have increased. The weekend papers often feature more ‘human interest’ stories with a youth focus. The weekend newspapers also, from time to time, include child-focused supplements or lift-outs. If these supplements were included in the study it is likely the percentage of youth voices would have increased slightly. The monthly magazine The Nation was not included in the study. It publishes mostly analytical articles on political, social and economic issues, and rarely publishes stories specifically about children or young people. It does not profess to write youth-focused stories. Therefore, if The Nation was included in the study it is reasonable to suggest there would be few (if any) stories about or involving young people, and so, it follows there would be few (if any) voices of young people. Why are children and young people not being heard in the Swazi media? What can be done to give children and young people a voice in the media? And what can be done to make sure this ‘youth voice’ is conveyed in a sincere and meaningful way? This research also raises several questions about the general standard or journalism in Swaziland. In short, if a journalist was writing a story about you, would you expect that journalist to get a comment from you? Or at least try to make contact to tell you what was going to be said about you in a public forum? You may forgive a reporter if, from time to time, due to lack of time or other work pressures, they do not get your opinion (or your facts) when writing a story about you. But, in the case of children and young people: if the media, writ large, write 72 stories in 11 days about you and only ask for your comment 7 times, then, as a group, you may be somewhat concerned. The thought that children and young people do not have much say over their lives in the first place only perpetuates this concern. ‘Children are seen and not heard’, is a phrase that could be used to describe this study. The loser in this scenario — beyond the children and young people themselves — is the reading public. The public are getting ill-informed, misleading and shallow stories: stories consistently ‘about’ people or topics but rarely delving into the hard questions; hardly ever seeking the facts or comments from the people who are most affected by the story — the children and young people themselves. What are MISA and Save the Children doing to train journalists and to help give children and young people a voice in the Swazi media? We are running practical training sessions for journalists, where they meet with young people to hear their stories. Earlier this year MISA-Swaziland ran 3 of these sessions and trained 10 journalists. The journalists, in groups of 3 or 4, travelled to 3 schools and spoke with about 50 students. The journalists then wrote stories that accurately reflected the voice of those young people. Many stories were published by the newspapers that the journalists work for. In this sense, the theory and practice of the training came together, all centred around the genuine voice of the young people. Tags: africa, children, journalism, media, MISA, research, save the children, swaziland, training, voice, young people, youth. Bookmark the permalink.